This book is witty, fast paced, fun, and unique. The story is told in so many other formats than just your generic chapter format. I really enjoyed this book, it’s everything I wanted it to be and more, (pun intended). Madeline has a rare disease that makes her allergic to everything, the only company she has is her mom and her nurse, she has never been outside of her house, and she has to go to school online. Madeline for the most part is content with this, (she doesn’t give herself any choice but to be), that is until a new family moves in next door and she sees Olly. She immediately wants to know more about him, she starts to fall in love with him, and then everything just goes downhill from there. Format. I was so excited when I opened the book and saw all of the unique medians that are used. There are pictures, charts, texts, and emails to name a few. I loved these so much it make the book much more fun to read and it fit in so well with the plot and the characters. To be honest, the format alone could have made me adore this book. Olly and Madeline. This might just be one of the cutest relationships. They are so different and witty. I loved reading all of their interactions, it was very easy to really see the two characters personalities through the emails and messages. The relationship it’s self is just so sweet cheesey, I enjoyed it. The plot. I liked 90% of the plot in this novel. The whole thing was fast moving and kept you interested and always wondering what would happen next. Then we got to the ending and things went from “fast paced” to “who hit the fast forward button?” I didn’t mind this too much, but I know some people were pretty upset by it. Instalove. I know, I know “no one likes instalove, instalove is unrealistic.” But here is the thing, I don’t mind a little bit of instalove. Especially not in this case. Madeline has been locked in her house, which would make her have very little social skills, not to mention the fact that she hasn’t seen many people offline. So in my humble opinion it makes sense that she would fall for the first guy that she has any real life interaction with, granted I didn’t expect her to take things as far as she did. There is my thought on the topic, take it or leave it. Yep, their innocent relationship doesn’t stay that way. It’s not what I would call explicit, and it’s pretty minimal (like I think it was only discussed for a page, maybe two). I really liked this book and how different it was, that being said there were a few things that just don’t add up. I won’t go into details because of spoilers. Nicola Yoon, she writes her first drafts by hand in notebooks, which I think is so neat. Also, her husband did the illustration for Everything, Everything. Be sure to check out her website and her Twitter. What are your thoughts/feelings towards instalove in general? 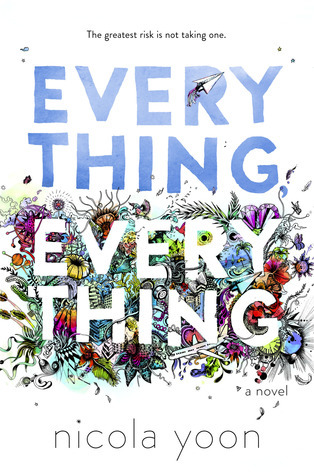 Have you read Everything, Everything, if so what did you think about it?